Describing both a beach and the built-up resort area around it, Praia da Rocha ("Beach of Rocks") is one of several popular tourist destinations in southern Portugal. The "rocks" in the name refer to the stunning limestone cliffs behind the main beach—other than the occasional boulder, it's all sand for over a mile! Famous for its photogenic setting, clean water, and fun-filled nightlife, there’s plenty on offer for families, couples, and singles alike, whether you’re going for a week or more, or just a couple of days. 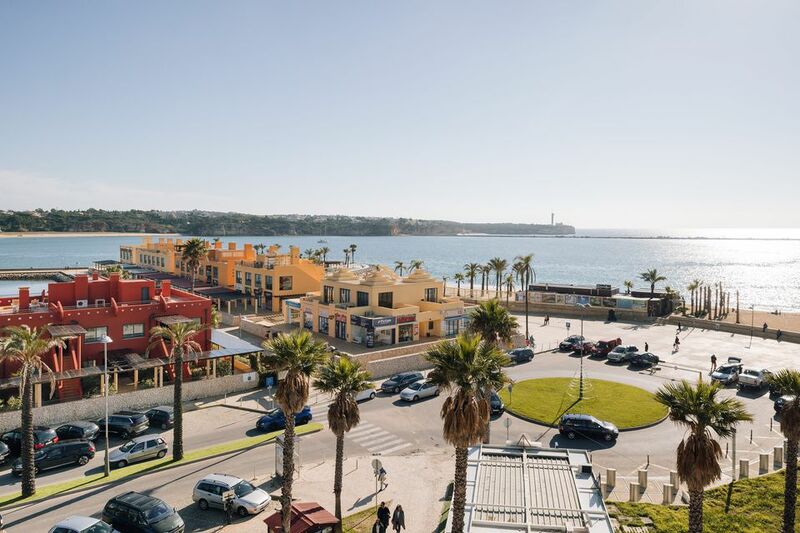 If you’re thinking about taking a trip to Praia da Rocha, we’ve got everything you need to know, including what to expect, the best ways to get there, and how to make the most of your time in the area. With its long stretch of golden sand filled with umbrellas, hectic promenade crammed with bars and restaurants, and towering hotels overlooking the action, Praia da Rocha is the embodiment of an Algarve vacation destination. The area has been welcoming sun-loving visitors since the 1930’s, and is one of the oldest resort areas in the country. Developed almost entirely to cater to the area’s burgeoning tourist population during the summer months, it’s a place for working on your tan and enjoying your vacation rather than exploring Portuguese history and culture. If you are interested in digging further into local life, however, there’s plenty of opportunity nearby. Summer visitors to Praia da Rocha come for two reasons: the beach and the nightlife. The town beach is long and wide, so it’s rarely packed even in the height of tourist season. If things do get too busy, there are many other small bays and coves tucked in the cliffs a short distance along the coast. Jet skis, kayaks, and pedal boats are readily available for hire, with the sheltered bay having clean and calm, albeit cold, water for much of the year. There aren’t any strong currents to worry about, and lifeguards are on duty to help anyone who gets into trouble. For those who’d prefer to stay on the shore, sun umbrellas and loungers are available to rent for a few euros. The area’s weather makes it appropriate for beach vacations from May through September, with most tourist activity ceasing in Praia da Rocha from about the end of October. If you visit between then and April, you’ll have the place largely to yourself, other than for a week or two around Christmas. Most of the region’s rain falls between November and January. While Praia da Rocha is a largely family-friendly destination, it still has plenty to offer once the sun goes down. The beach parties are legendary, and many bars and nightclubs stay open until the small hours. There are several Irish pubs and karaoke bars on the main strip, while the restaurants and bars alongside the marina offer more upscale dining and drinking options. As with the rest of the Algarve, and indeed much of the country, English is widely spoken, especially by anyone who works in the tourist industry. Restaurant menus and most other signs will have an English translation. Praia da Rocha sits in the southwestern part of the Algarve. The nearest city is Portimão, 2 miles inland, and once you get away from the beach, the two places start to quickly merge together. Buses run regularly between the coast and downtown Portimão, but if you’re planning a beach vacation, make sure your accommodation is actually in Praia da Rocha. The nearest major airport is in Faro, around 45 miles to the east, and it’s where most international visitors arrive. Getting from there to Praia da Rocha by public transport is more difficult than it should be, since it requires multiple transfers via downtown Faro and Portimão, and doesn’t run later at night. As a result, most people choose to rent a car or book an airport transfer instead—expect to pay around 55 euros each way for a private transfer. Don’t take a taxi from outside the airport if you can avoid it, as it could easily cost 100 euros or more by the time you reach your accommodation. If you’re coming to Praia da Rocha from elsewhere in Portugal, you have more options. Buses and trains run south from Lisbon to Portimão via either Tunes (train) or Lagos (bus), taking around four hours in either case. If you tire of Praia da Rocha’s bustling boardwalk, or are looking for new ways to entertain yourself or the kids, there are several good options in the surrounding area. As the largest city in the western Algarve, Portimão has many attractions, and lies a short bus or cab ride away. Once a major hub for shipbuilding and sardine fishing, it’s turned its sights towards tourism in recent years, and is now a laid-back, residential city. The old docks have been redeveloped into a pedestrian walkway that leads to the attractive old town, where there’s plenty of opportunity for shopping, exploring the local culture that’s largely missing from Praia da Rocha itself, or just relaxing with a coffee or wine in a shady tree-lined square. Directly across the Arade estuary, and accessible via a short ferry ride from Portimão, lies the old fishing village of Ferragudo. With a pretty harbor and dozens of great seafood restaurants, plus easy access to some of the region’s nicest local beaches, it’s a great place to spend half a day. For a more energetic alternative, take a shuttle bus out to Slide and Splash, a huge water park five miles from Praia da Rocha. Open from early April to the end of October, it’s expensive by Portuguese standards at 27 euros for adults and 20 euros for seniors and children aged 4–10, plus 7 euros return for the bus, but you easily get a full day’s entertainment for your money. Finally, you can get a feel for local history by taking a bus or boat trip to Silves, the fortified former capital of the region. Once an important trading post and defensive stronghold against invaders, it’s now a sleepy town that’s dominated by a huge red-brick castle and Gothic cathedral. The oldest parts haven’t changed much in half a millennium, and couldn’t be more different to the resorts along the coast.